Tha standard school laboratory test for carbon dioxide is to bubble the gas through limewater. The limewater turns milky. On the left of the picture the green copper (II) carbonate starting material can be seen turning black due to the formation of copper (II) oxide. On the right the colourless gas produced is being bubbled through limewater which turns milky, showing it to be carbon dioxide. This animated gif is a little jerky, but at least the jerks in the apparatus serve to separate three different time phases during the experiment. Carbon dioxide has another well known chemical property – it puts out flames! It is, of course, used in fire extinguishers and is particularly useful in fires where the use of water would be problematic. 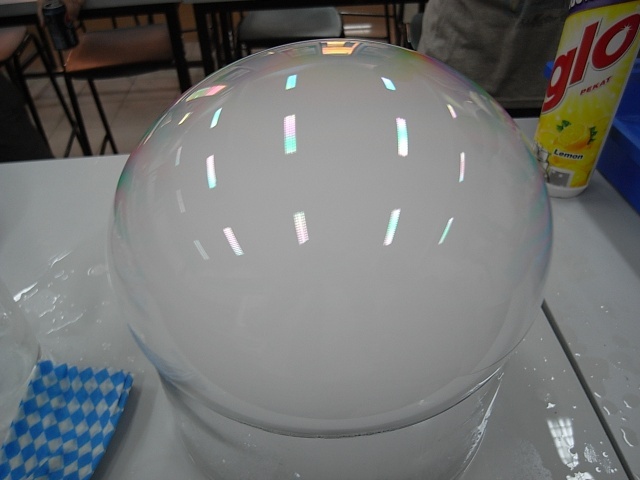 We thought we would demonstrate the flame extinguishing property by using a giant soap bubble filled with carbon dioxide. The bubble was made by putting dry ice into some hot water in a trough and them dragging a cloth soaked in a solution of liquid detergent across the surface of the trough. We then placed six candles around the bubble and waited for it to burst. This demonstration could be used to illustrate CO2 welling up from lakes due to underground geological activity. Enough of carbon dioxide, what is the test for chlorine gas in the school laboratory?